School’s out. Work handover’s completed. It’s holiday time! Bags packed. Kids packed. Pets sorted. Now what? You can just about remember where you’re going, but how do you get there? What time can you check-in? Did you actually need to pack the kitchen sink or could you free up some space in the car for your clothes? Don’t panic! Here’s everything you need to know (or consider) before starting the engine. Open your emails (do you remember which email account you used to make the booking?). Use the search function to find emails from your cottage company or search for ‘directions’. You should find an email that provides the name and address of the cottage as well as some details for finding it. A key safe, most likely. There’ll be an email (or maybe a text message) telling you the code to the key safe. And it’s generally recommended that you leave the keys in there each time you go out. Part faff-saving pedantry and part simplicity: you’ll know where you left them, you won’t have to hide the keys in the car, you won’t lose the keys in your handbag, they won’t fall out of your pocket and get buried in a sandcastle, you’ll be able to get back into the property at the end of the day. Typically, holiday rental check-in time is 4pm. Some might manage a swift changeover from the previous guests and be able to make that 3pm, but check before you leave. You want the place to be spick and span before you make yourselves at home. Oh and without wishing away your holiday, check-out time is usually 10am. If you’re going on a dog friendly holiday, please don’t forget to pack the pooch. Pet friendly cottages account for somewhere between a third and a half of our properties, so in those cases the woof will be welcome and probably provided with food and water bowls. But check the property listing for more details in case there are also leads, balls, poo bags (so glam!) and the like also available at your accommodation. What you’ll probably find in the guest information pack is a list of decent local dog walks so you don’t get too lost exploring your holiday destination! If you’re going to arrive after dark, you’d be wise to pack a torch. Even some seaside cottages are nestled down winding footpaths. You never know how steep the driveway might be until you get there. And if you’re out in the sticks on an off-grid holiday there won’t be any street lighting. If nothing else, you’ll appreciate the honed in lighting when aligning the digits on the key safe combination lock. Any hopes of a holiday lie-in? Most holiday cottages provide a highchair and travel cot. And if you mentioned bringing children, you’ve probably already confirmed what baby and toddler friendly facilities are provided. Some properties go more than the extra mile when it comes to kids while others just provide the basics. But pack your own adjustable blackout blind if your little’un can’t sleep beyond sunrise without it. Uber child friendly properties include Barton Manor Lake Cottage in East Cowes, which even provides a buggy and Hastings House in Northumbria, which has baby steriliser, toddler cutlery as well as toys and a whole menagerie of child friendly equipment. Beach towels are rarely provided in holiday accommodation, so dig yours out and put them in your beach bag so that you’ve got that too. Then grab the SPF (yours and the kids), sun hats, rash vests and boardies or swim-sun-suits. Don’t forget your own swimwear! Now for the practical stuff: unless stated as provided you’ll want to pack a cool bag, picnic blanket, windbreaker and mallet (although you can hire these last two on most British beaches). Many UK self catering cottages provide buckets and spades for the smallest of their guests. But if you find your coastal cottage doesn’t have any the seafront shops sell them for a few pounds each. Then you can always leave them behind for future guests when you head home. And you really don’t need any more sand in the car, do you. Pack your waterproofs and a hoodie or woolly jumper for chilly mornings or drizzly days. You can still spend a couple of hours on the beach in the drizzle if you’re well prepared – the kids really won’t care (especially if there’s a promise of a hot chocolate and some marshmallows at the end of it). And if the storm clouds roll in you’ll likely find some token books and maybe a board game to keep you entertained indoors before heading to the aquarium. If the beach isn’t on your radar from your country cottage, you’ll still need the SPF and those hats. You might want to consider some lightweight socks for your walking boots if you’re off exploring. Check that your shorts don’t chafe and look for a water bottle that’ll suffice between pitstops and preferably keep your refreshment of choice cool. If your holiday let has walkers in mind, you’ll probably find Ordnance Survey maps in the guest information pack, but if you like to plan and have your week’s walks all lined up, don’t forget to pack your maps. You might (or you might not) find milk in the fridge, loo roll in the bathroom, bread in the cupboard and butter in the dish. If you’re not sure what’s provided, just ask. And if necessary book an online shop for the essentials before you leave home. Most supermarkets deliver to even the remotest of destinations in the UK. It might not be your usual choice of supermarket, but come on, holidays are all about experiences. Don’t order everything though. No we don’t want you to spend your holiday shopping, but we do want you to savour the very best of local produce from the butchers, greengrocers and farmers markets. Top tip: ask your cottage agency for recommendations of local firms that make and deliver homecooked meals – we all like a feast after a long journey. If your cottage provides a welcome hamper, you might find a bottle of plonk greeting you upon arrival. After a long journey with children in tow, it might be the first thing you reach for (sod the unpacking, just for now). Although all good Visit England inspected properties should have a corkscrew, I can hear mums and dads across the lands hollering with expertise: pack a corkscrew just in case. And for a refreshing tipple on the beach one day, pack a wine cooler to chuck in the freezer too! 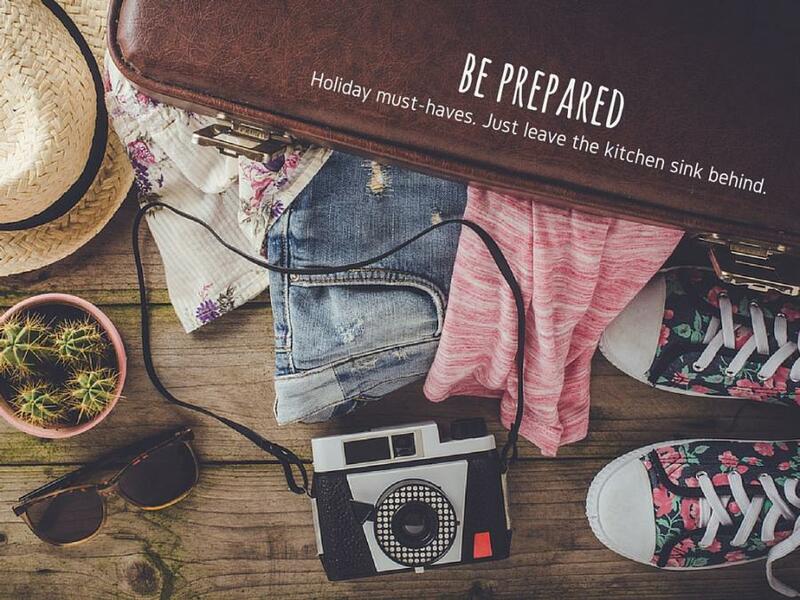 So we’ll leave you to get on with your jolly holidays with a perfectly ample kitchen sink provided leaving plenty of room for those extra changes of clothes and layers in the boot of the car or roofbox. Happy holidays!